Kick back and relax on this five-hour wine tour near Portland. 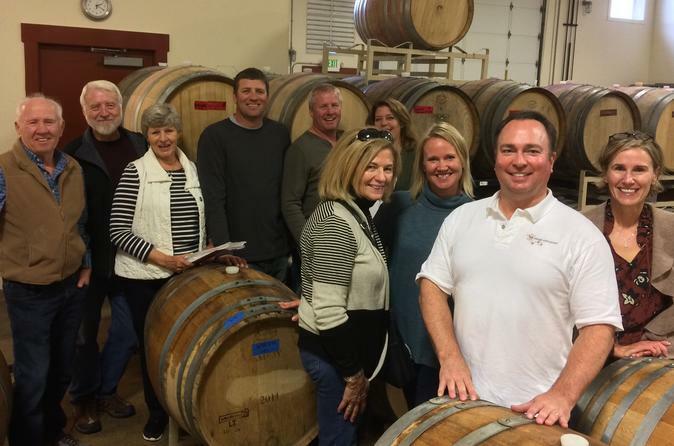 This small group, semi-private tour will take you to 3 or more wineries in Oregon’s famed Willamette Valley. Limited to six people, the tour includes a lovely charcuterie platter of locally sourced items along with snacks and water. Sip delicious wines from boutique vineyards and enjoy the beautiful scenery. Your WSET certified Personal Sommelier will curate and serve as your expert guide to help you understand why the Willamette Valley is so unique. This is not just another wine tour. It's a rare opportunity to spend the day with a wine professional and learn more about this amazing wine region and your personal palate. We specialize in "getting personal about wine". The Willamette Valley of Oregon is home to some of the best wine in the Pacific Northwest. Bordered by the green coastal ranges to the west and the snow-capped Cascade Range to the east, the valley features rich alluvial soils washed down from ice-age floods and numerous microclimates along scenic waterways and rustic farms. Although the area offers an abundance of varietals and styles for the discerning wine drinker, it is probably best known for its world-class Chardonnay and Pinot Noirs – the famed grapes of Burgundy in France. After your complimentary morning pickup from your centrally located Portland hotel, residence or central landmark, the tour begins with a brief introduction from your driver and guide – who also happens to be a WSET-certified sommelier. As you leave the frenetic pace of the city behind, your guide will fill you in on the local history and unique qualities that make the region such an ideal place for growing high-quality, premium wine grapes. Also, from April to October this seven-hour public tour includes a pickup at the Newberg Sportsman Airpark in conjunction with our hot air balloon package. Your tour will visit 3 to 4 wineries throughout the day and include bottled water, healthy snacks and a complimentary lunch featuring vegetarian and gluten-free options (usually a diverse charcuterie platter enjoyed at our second winery). Tasting fees are included for all stops up to $20 and you will have abundant options to purchase, ship, and sample additional wines at your own discretion and cost. The trip ends with a drop-off back at centrally located Portland locations or the Newberg Airpark, where you can proceed to nearby neighborhood restaurants to sample the local fare or back to your hotel or lodging to sleep off the amazing wine. Note: Groups of two or three may be combined.